Mobile is hot. According to the Mobilenomics video from Socialnomics, not only is Google mobile search up by 400% with research showing that 70% of those mobile searches lead to action within an hour, but also that iPhone sales alone outpace births, and more people in the world own a mobile device than own a toothbrush. And yes, I checked. As a small business owner, you cannot ignore the mobile trend, but neither can you jump blindly on the bandwagon. You need to understand what mobile means to your business; you need to understand how your customers use mobile devices to interact with your company; and you need to understand the role mobile plays in your sales process. A new tool from Google helps you do just that. The Full Value of Mobile Calculator enables you to explore how mobile interactions generate revenue for your business via five core purchasing paths: in-store, calls, app downloads, cross-device, and direct mobile device sales. To calculate revenue for each path, you input information about mobile advertising clicks, percentage of clicks that turn into sales, and average sale value. Using that information, the tool calculates your revenue in a channel and provides you with a break-even cost-per-click. Each calculation is slightly different, and the on-screen help provides guidance for how to determine values for the data you enter. For example, to calculate in-store sales you enter the number of clicks on a “Get Directions” link in your mobile search ads. You then enter a percentage of total clicks that turn into visits to your store, the percentage of those that turn into actual sales, and the average sale amount. For even more accurate mobile value calculations, you can upload Click Type reports from your Google Adwords account and use them to determine actual ROI (Return on Investment) and CPA (Cost Per Acquisition) for your campaigns. The five path calculations are geared towards evaluating clicks and sales generated from mobile advertising. But that is only part of the story. The final “Full Value of Mobile” tab in the calculator asks for information about non-advertising-generated actions on your mobile site to add an additional dimension to the ROI calculation. The calculator is not only a helpful tool for understanding ROI for sales directly generated from a mobile environment — such as a purchase made from the device itself — but also for understanding how mobile affects your overall business. For example, you might learn that people who click your “Get Directions” link purchase half as much as those who click to call. Or, you might determine that people who access your traditional website are twice as likely to purchase as those who visit your mobile site, and that 75% of those desktop visits are spurred by an initial visit to your mobile site. You might also find out that mobile is not a significant revenue generator at all, and that your customers prefer to interact with your company in another way entirely. 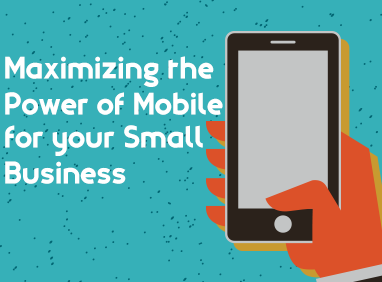 Once you understand the role mobile plays in your small business, you can make strategic decisions about how to best leverage its explosive growth. This Small Business Tip from PaySimple offers one more way to make your small business more productive. Get the PaySimple Mobile App today.